I am so excited to assist Mansi in this process. This is going to be an awesome team!!! We are excited to announce that Die Cuts And More is Having its Design Team Call again, which is open Internationally! 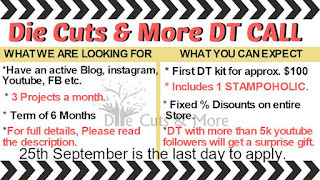 Lots of Free products from Die Cuts And More Store from time to time. And a free Stampoholic (Nano/regular) to all the team members in the beginning of the term. Fixed % of Discounts on all products in the DCAM store. Cardmaking experience, including use of the DCAM brand Products, as well as stamps and other products carried in our store. Have the ability to photograph projects for use on blog and social media. Design team members are responsible for making 3 projects per month. You will need to post your project to your blog and the DCAM blog on a schedule that will be provided to you by the design team manager. Share current DCAM Sales and Promotions on your blog and through social media outlets. Display the DCAM Design Team Image (which we will provide) on your blog. Watermark your photos using the watermark we provide for you. Design Team term will run for 6 months and may be renewable if both parties are agreeable. Promote DCAM STORE and the products we carry whenever possible and appropriate. Join our Design Team Private Facebook Group in order to keep in touch with other members and Design Team Manager. At least three samples of your work, including photos. A brief introduction and why you’d like to join our team. Thanks for sharing this LeeAnn.. You are a Darling !! !